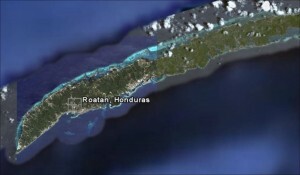 It makes sense from a Google Earth perspective that Honduras would have bonefish. Turns out it does. One place that seems to be booking for your Honduran Bonefish get away is Mango Creek Lodge, located on the island of Roatan. One thing I found interesting in reading Mango Creek’s list of what to bring were the fly sizes… up to #10. That’s a trout fly! The fish seem to be on the smaller end of the spectrum, that 3-5 pound size that lets you know you’ll probably see schools, but won’t need to break out the 9 weight. As far as lodges go, Mango Creek is far from the most expensive. A 7 night, 6 fishing-day stay is $2,200 (double occupancy). That’s not too bad, really. Oh, but it will cost about $900 to fly there and back. Details. 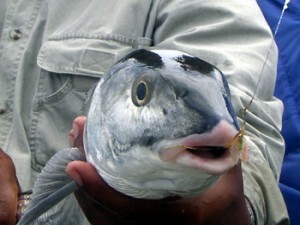 You can also catch bones on the Honduran Island of Guanaja, according to the Fish Guanaja Honduras blog. The author says he fishes for world class bones, but no pictures or sizes are actually mentioned… so, who knows. Emerald Waters offers a trip to Guanaja and talks in glowing terms about the fishery. A week with them will cost you about $3,200 per angler. It seems Hurricane Mitch did some real damage to the island and the island’s mangroves back in 1998. The island and the fishery are still recovering, but are doing so in relative isolation. See… now that’s a good looking fish right there. When you’ve done the Bahamas, the Keys and the Seychelles, you may have to check out Honduras at some point too. This entry was posted on Tuesday, October 6th, 2009 at 3:29 am	and is filed under Locations. You can follow any comments to this entry through the RSS 2.0 feed. You can leave a comment, or trackback from your own site. Been to Roatan and Mango Creek. Very nice on both fronts. The DIY situation there is pretty good, actually, though I did have mixed results. Took a $5 (US) cab ride from West Bay (or West End, can’t remember which) to Flowers Bay (I think) and walked a flat there. Saw tons of bones on the flowing tide and managed to feed a few, but pulled the hook on all of them. Too eager, I guess. Then the bite just shut down… didn’t help that it was blowing like 15-20 the whole time either, so casting wasn’t exactly spot on. I also fished with Miguel (a very good guide) out of Mango Creek on a day trip. What a deal. Day starts at dawn w/ pickup at a small waterside bar and a hop to the nearest flats. Had shots at permit within 5 min on the water. Then we head to the Lodge for breakfast (awesome) and then back to the flats for the duration. Lunch is in there somewhere (beers included) and then drop off back at the bar (w taxi waiting) at dusk. Now THAT’S a full day. No worries. Anyways, I recommend it and I’ll be back someday… hopefully to fish w/ Miguel again. Good guy who put me on fish. Man, that sounds like a good time. What did you think about fish size? 3-5 lbs or nicer? Remember anything about fly sizes (#10’s)? Before or after the hurricane? Oh, so many questions. Well, the flies were small – #8’s if I remember. I personally wouldn’t go smaller as it’s hard enough to hook fish on one that small. Fish were actually decent in places. I picked up a 5+ pounder in like NO water on the neighborhood flat next too the lodge, and saw several 6-7 pounders throughout the day. That fish was awesome though: one of my personal best. I had to cast over a blown-down tree trunk (from one of the hurricanes) and the fish had his back out of the water when it ate the fly. Sweet. The fish on that flat were very tough, though and it really helped that I had a 9’6″ 7-wgt that threw a nice soft line for that quiet water. Well, that sounds pretty good, really. I have a 9’6″ 7-wt (St. Croix) that I’ll be bringing with me to Grand Bahama in January (among other rods). The 9-wt is just not that delicate for skinny water fish. I’m tying mostly #6’s, with a few #4’s and fewer #2’s mixed in. That sounds good. Now, for the Bahamas I’d recommend some bigger and heavier flies than for Honduras, for sure. I mostly fish with Gotchas and Gotcha Clousers in #4’s and #2’s. Lead eyes are a must for some flats, especially if the wind is up, so don’t overlook those flies. When you need them nothing else will do, especially for big fish… and there are probably big fish there. So, I’ll often have several rods rigged for bones over there, the heavier sticks with heavier/bigger flies – maybe a crab or #2 Gotcha Clouser http://www.fish-bones.com/images/gotcha-clousers_bright.jpg, and then a lighter fly – say a bead-chain #6 Gotcha – on a lighter rod. That way you don’t have to re-rig when you change flats or the tide changes on you. Good call. I’ve only been to GBI once, but I’d say there is a pretty wide range… 1 pounders to 12 pounders. Mostly, I’ll be on foot and self-guided, which makes the second rod a little harder to carry with me. Bits of advice I’ve received have included having a wide range of weights… mono eyes to dumb bell eyes on a few patters… weight often being more important than pattern. I think someone had recommended I tie up a lot of #6’s, saying they thought a #6 was the perfect size… but I don’t know why I’m tying up so many #6’s… might be my trout fishing roots. I just picked up some #2’s at my local shop today, as I was already planning to get a little more size variation in my box. oh… I can’t wait to get back out on the flats! Don’t forget little crabs – Yarn Crabs or baby Merkins. They are a must when the fish are being picky with the usual stuff (Gotcha’s, Clousers, etc.). I’ve seen fish wander over from like 10 ft and totally CRUSH a crab fly when they’d shy off a stripped Gotcha or other shrimp pattern. Best luck I’ve had with crabs is to cast ahead, let fish get into range, and give the fly a slow, 6″ strip and then let it fall. You’ll know if the fly’s been seen and you usually don’t have to do anything else but wait for the fish to tip up on your fly. Crab flies provide some of the sweetest takes on the flats. I like tan, pinkish, gray, yellow, olive and brownish, depending on the bottom. please guys, hook size has no relation to fish size. I have caught 27 inch Brown Trout on the San Juan using #24 dry flies, seeing them is more the problem. We at Mango Creek welcome your comments. We went to smaller flies in the first of the season to match the small shrimp the fish were eating. Remember to ” match the hatch” it works even is salt water. No relation to fish size? Doesn’t the size of the prey have some impact on how big those fish can get? One theory I’ve heard about Belize is that the prey items are actually smaller than in some other places… that means the fish generally get less energy from each item and don’t grow as large as they do in some other places. A 5 year old fish may be the size of a 3 year old fish in the Bahamas. Now that 27″ brown can eat a LOT of #24 midges or bwo’s or tricos because there is a ponderous number of them and they can make up for the small size of the prey with the quantity of the prey. 27″ brown is a hell of a fish too. I’d bet he was eating other fish in addition to those tiny dries, no? Permit. Feb. 1st caught my largest Bone ever on the fly rod with Michael as my guide from Mango Creek Lodge. If you look on there web site under What about Bob you will see the pics of we estamated it at 10 lbs it was 31in. long also you will see a pic. of the 25 pd Permit we caught on the same flat. We were using larger than normal flies in about the # 2 range. You can see in pic the fly used to catch the bone. They are there you need someone that knows where they are.